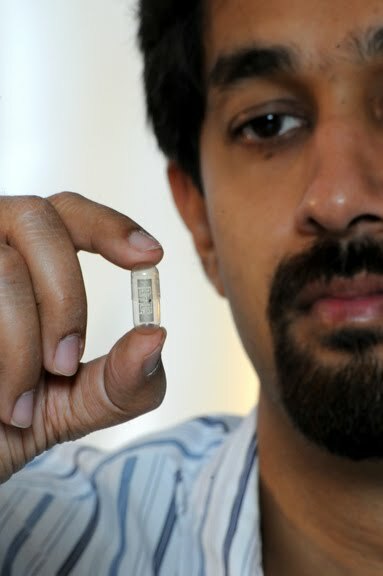 Rizwan Bashirullah, a University of Florida assistant professor of electrical and computer engineering, holds a pill capsule designed to signal when a patient has swallowed it in this photo taken March 19, 2010. The pill is needed because many patients fail to take their medication, exacerbating medical problems, causing unneeded hospitalizations and leading to an estimated 217,000 deaths annually. Consisting of an antenna made with nontoxic silver nanoparticles and a tiny microchip about the size of a period, the pill works by communicating from inside the body with a stand-alone device worn by the patient. “It is a way to monitor whether your patient is taking their medication in a timely manner,” said Rizwan Bashirullah, UF assistant professor in electrical and computer engineering. Such a pill is needed because many patients forget, refuse or bungle the job of taking their medication. This causes or exacerbates medical problems, spurs hospitalizations or expensive medical procedures and undercuts clinical trials of new drugs. Bashirullah, doctoral student Hong Yu, UF materials science and engineeringProfessor Chris Batich and Neil Euliano of Gainesville-based Convergent Engineering designed and tested a system with two main parts. To request a print-quality image, email [email protected].